Birdwoman Knits | …and cooks, and writes, and takes photographs. …and cooks, and writes, and takes photographs. 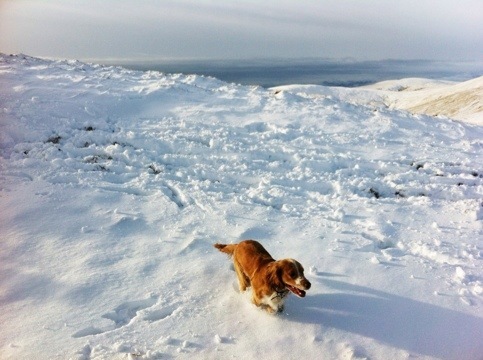 Today was a momentous occasion in Rory’s life: his first Munro. 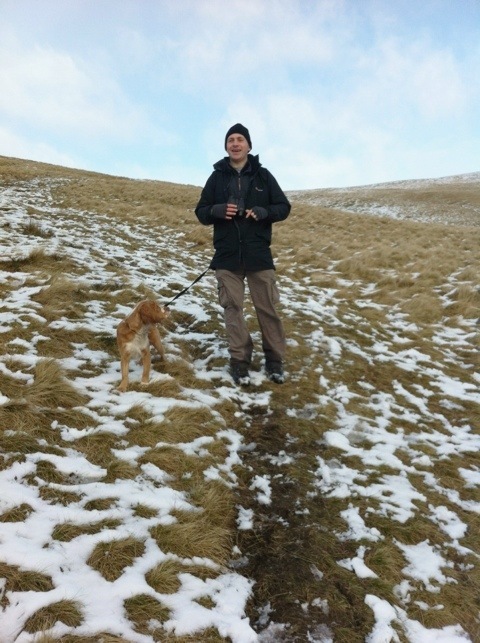 He’s been up lots of hills this year, including three ascents of Ben Ledi! But until today he had never bagged a Munro. Chris had heard reports of ring ouzel and ptarmigan on Meall Ghaordaidh, and hoped to add them to his Stirlingshire year list. We set off for Killin with our friends Ben and Helen, and headed off up the hill. Chris and Ben on the ascent, with Glen Lochay behind. Despite walking at a fairly leisurely pace, we reached the top in 3 hours. 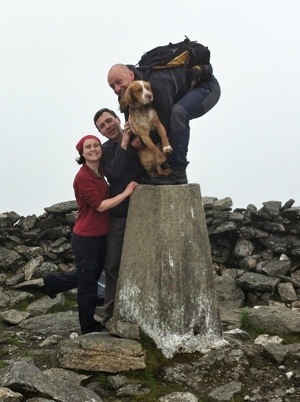 Helen, Chris and Ben with Rory at the summit. Despite a forecast for the weather taking a turn for the worst in the afternoon, we only had a brief shower of rain, and the cloud lifted from the top, allowing us to get a good view to the north. 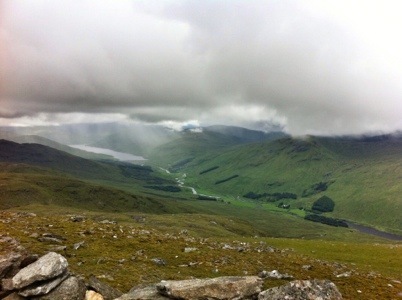 Glen Lyon from the summit. We took a different route down. Eventually we got back to the car and celebrated with hot chocolate and cookies. Rory has been given a bath and the obligatory tick check and is now lying beside me on the sofa in his favourite position, with all four paws in the air. And I’m afraid Chris didn’t see any ring ouzel or ptarmigan. A good day, nonetheless. Remember the tiny puppy who came home with us a year ago? 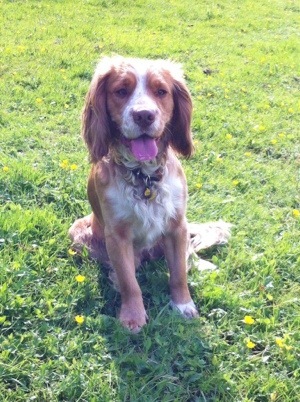 He’s now a fully grown, handsome dog. Rory has brought us so much joy and love over the last year. It’s been wonderful seeing him mature from pup to adolescent, while still retaining his energy, enthusiasm, friendliness and love of stealing shoes. He’s been up several hills (I think he’s already done Ben Ledi three times and Ben Cleuch at least twice) and since he’s been a year old and fully grown I’ve started running with him. He’s a wonderful running companion – in fact, he’s even better behaved when I’m running than when I’m walking. He still pulls on the lead and sometimes runs off to investigate things, but for a dog of his young age he’s really very good. He’s lying at my feet on the patio as I write this, no doubt looking forward to this afternoon’s run! The school summer term finishes early in Scotland, and this year we finished even earlier than usual, with the pleasing result being that my summer holiday started on Friday! So expect the usual holiday-induced return to blogging for the next few weeks. I kicked off the holiday in true knitterly style with Woolfest. It’s four years since I last went, and when my neighbour asked if I wanted a place on the bus that the Stirling knitting group had organised I jumped at the chance, and persuaded my friend Tor to join me (which wasn’t that hard!). So it was that I was up at the crack of dawn on the first day of the holidays, instead of a much-needed lie-in, and on a bus leaving Stirling at 7.30. It was worth it. Woolfest would have been fun had I gone just for the shopping and to see all the sheep, alpacas and angora bunnies, but the people made it fantastic. Speaking of people, I also got to meet Kate for the first time, despite having corresponded occasionally online for years. 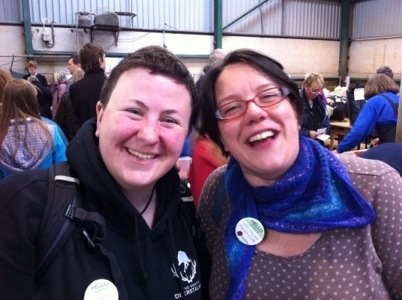 Being a bit of a fangirl, I had selected my Manu cardigan to wear because I knew she would be at Woolfest! 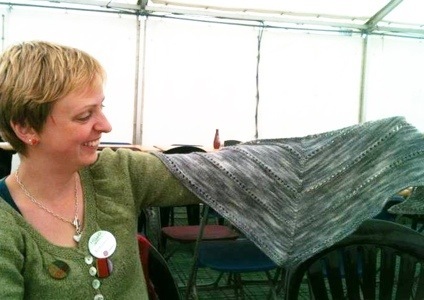 It was great to finally meet her (and see the original samples of her gorgeous patterns – Rams and Yowes especially!). Being a little overtired from general end-of-term-itis and the early start, we took a break for tea and knitting, and I managed to finish my current project. It’s Age of Brass and Steam, in a Skein Queen merino/cashmere blend I got at the Glasgow School of Yarn. It was a very quick knit, and only took a week. 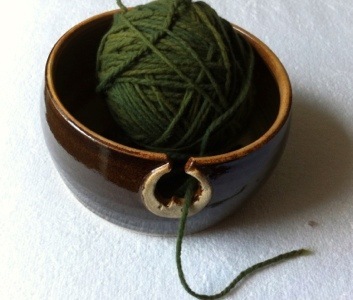 I must get round to blogging (and Ravelling) my recent knitting at some point soon! I didn’t actually do that much shopping, and I didn’t even buy yarn! 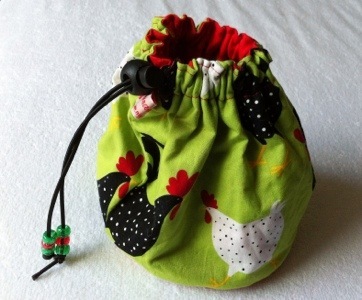 I did, however, manage to buy some new stitch markers, a cute project bag, and a yarn bowl. 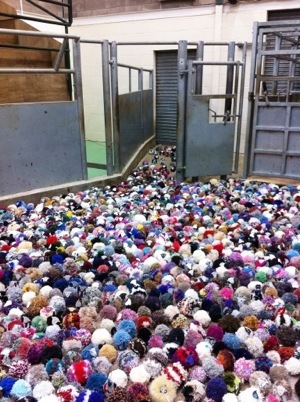 There was also a bizarre-but-wonderful art installation, consisting of many, many pompom sheep. We headed home after a very full day, and despite some technical problems on the way home (a fuel cap that wouldn’t come off and not enough fuel in the tank to get the bus home!) a great time was had by all. 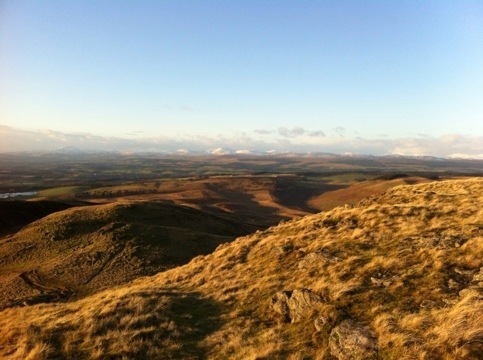 Yesterday we tackled Rory’s biggest hill to date: Ben Cleuch in the Ochils. We started from Tillicoultry, and walked up the Law. To those who are properly hill-fit, the Law is probably not too daunting, but it is very steep and I’d run 8 miles with the running club before starting out on the walk! All the same, I think we managed a fairly respectable ascent (although I still can’t imagine being able to actually run up it – and people do! There’s a race and everything!). 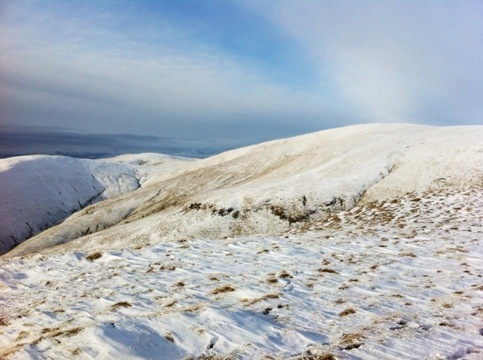 From the Law it was an easy ascent along the ridge to Ben Cleuch. 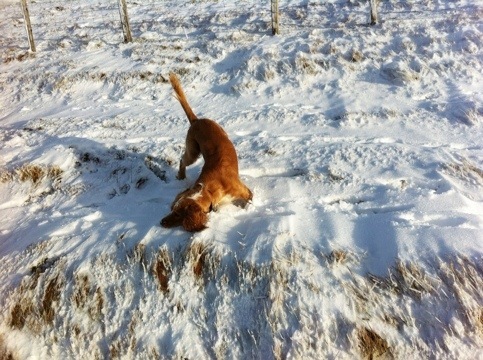 Rory kept diving into the snow and coming up with a face covered with snow. In fact, it’s very difficult to take photos of Rory when he’s outdoors because he never stands still. From Ben Cleuch we walked down the ridge of Ben Ever and then down to Alva Glen. 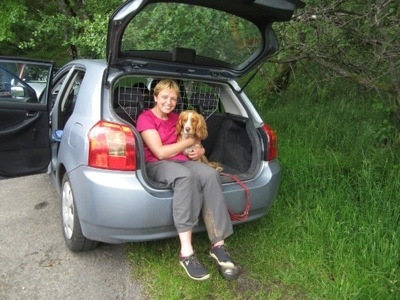 This was the first outing for some of my new outdoor kit – an OMM Last Drop 10l backpack and a Platypus. Both performed very well (although the plasticky taste of the Platypus will take some getting used to). 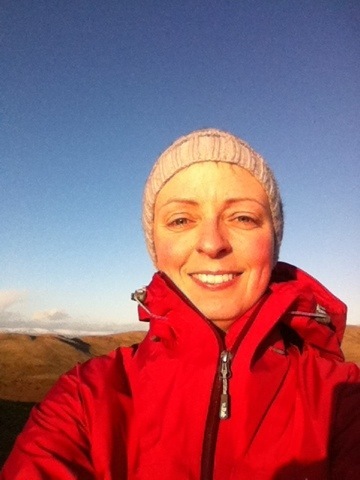 I’m particularly impressed with the backpack – despite its small size it comfortably fitted in it a litre of water, our lunches, my woolly hat, gloves and cowl, spare gloves, my lightweight waterproof, emergency torch, a map and compass. And I was barely aware of it on my back! I’ve also used it for running part of the way home from school, and it’s perfect for carrying my clothes, iPad, portable hard drive, etc. Today was a momentous occasion – Rory’s first hill! 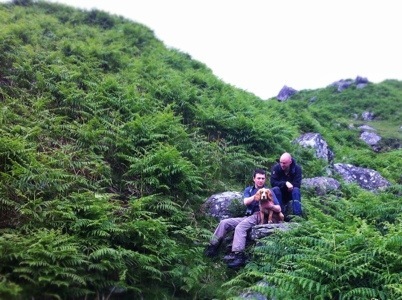 We made it a small one – King’s Seat, in the Ochils, from Dollar Glen. We went with my inspiring running buddy Helen and her husband, Ben. 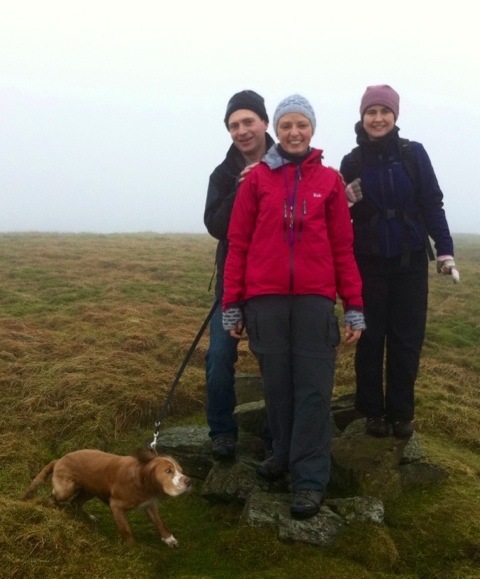 By the time we got to the top it was cold and foggy, but that didn’t dent our enjoyment! As you can see, Rory rarely stays still long enough to take a photo of him. He spent a lot of time off-lead, racing around joyfully. He got so muddy we had to give him a bath when we got home. He’s now curled up on the sofa, looking very tired! 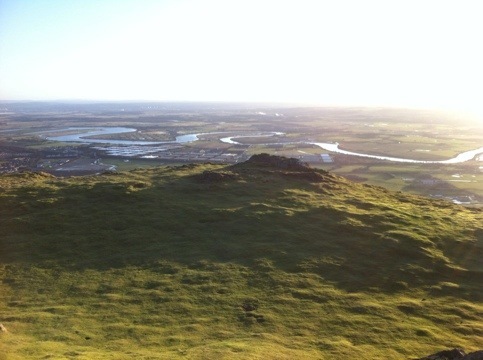 This afternoon we walked up a small local hill, Dumyat. We even cheated and parked, effectively, halfway up the hill, meaning that it only took 45 minutes to get to the top. We also had to leave Rory at home, as he ran into something in the dark a couple of weeks ago and is still limping a bit. Short though the walk was, it was absolutely glorious – the weather was so clear we could see right to the Forth bridges and Arthur’s Seat. It’s definitely whet my appetite for walking! We could have spent the afternoon tidying the house, but true to those New Year Good Intentions we opted to make the most of the (rare) sunshine and get outside! And I’m so glad we did. At the top we met a couple of people with their dogs, and got chatting to them. Turns out they were hill runners, a sport which I’m planning on trying! They recommended the local hill running club, so I might try one of their training sessions. All in all, a great afternoon. I don’t usually do New Year’s Resolutions, but I do like to start each year with some good intentions for the year ahead (the difference being, I am less likely to beat myself up for not managing a “good intention”). That’s not to say I was unhappy in 2011 – far from it. I have a great husband, wonderful friends, a fantastic job, and a PUPPY. 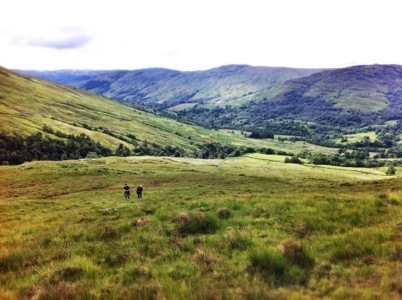 But as the year drew to a close I realised that I had spent so much time doing stuff that I hadn’t done enough of the things I do simply for enjoyment: hanging out with friends, going hillwalking, that kind of thing. I became used to being constantly busy – if I wasn’t working I was walking Rory (hardly a chore, but time-consuming), cooking, cleaning, or doing some other errand. In 2012 I intend to try to simply relax a bit more about chores, find ways to spend less time doing them (I got a slow cooker for Christmas, which should help!) and spend more time training and exercising Rory, spending time with Chris and our friends (quality time, not just crashing out in front of the TV or the Internet), and getting outside. I didn’t particularly enjoy the Edinburgh Marathon, I decided not to do the triathlon I’d registered for, and due to general busy-ness and Rory being so small, we haven’t got a single Munro to our credit in 2011. This year, I want to get out among the hills much, much more often. I want to bag a few Munros (my wish list is Ben Nevis, the Ring of Steall, Ben Vorlich and Stuc a Croin), but I also just want to walk Rory in nice places and I want to try my hand (or, rather, feet) at fell running. I’m tired of running on the roads! *A Spring half-marathon (or two), possibly Loch Leven. That’s probably more races than I’ve ever done in a year, but I’m geniunely excited about all of them. With the possible exception of the Spring half, they’re all different to what I’ve done before. 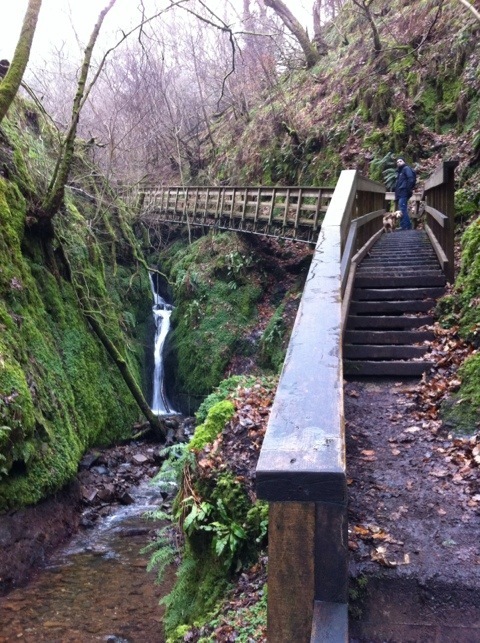 They’re all trail races, for starters, and the Corrieyairick has a substantial cycling component. I want to enjoy them, not get hung up about times and PBs. Finding time to train will be challenging, but that is, believe it or not, all part of Having More Fun. I’m hoping I can manage to cycle to school once or twice a week once the days get longer, take Rory with me on my shorter runs (he’s allowed to run a mile or so at the moment, but he’ll be fully grown in the Spring and able to go for gradually longer runs) and maybe run home from school once in a while. So here’s to More Fun in 2012!